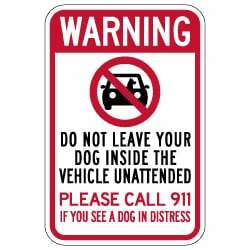 Warning Do Not Leave Your Dog Inside The Vehicle Unattended Sign - 12x18 - Rugged rust-free aluminum signs for outdoor use. Made of heavy-gauge reflective aluminum with anti-weather and anti-graffiti protection Available. Use this outdoor rated rugged aluminum Do Not Leave Your Dog Inside The Vehicle Sign in city parks, campsites, beaches, shopping center parking lots, or other areas you wish to warn the public of the dangers of leaving your pet inside of a hot vehicle. Temperatures rise quickly during the day and it can become dangerous for any pet left inside of a vehicle unattended. Exposure to extreme heat can be deadly, even with a window cracked open you still run the risk of causing serious harm to your pet.